Queen fans have voted the chorus of their mega-hit Don't Stop Me Now as the band's best ever lyric in a poll to mark the group's 40th anniversary. 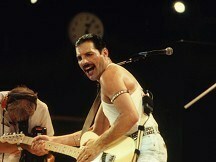 One in five fans favoured the line "Don't stop me now, I'm having such a good time, I'm having a ball" to celebrate the band's four decades, which coincides with what would have been Freddie Mercury's 65th birthday. Penned by Mercury and featured as the 12th track on the band's 1978 album Jazz, the song reached number nine charts on 26 January 1979. Coming in second in the HMV poll of 3,000 Queen fans was the lyric from The Show Must Go On - "My soul is painted like the wings of butterflies, fairy tales of yesterday will grow but never die. I can fly my friends." Gennaro Castaldo, of HMV, said: "Whilst you'd imagine there might be more obvious choices, we shouldn't be too surprised that a lyric from Don't Stop Me Now is a clear favourite among fans - it's such a feel-good, life-affirming song." A charity is also urging people to 'Be Freddie For A Day' to raise money to fight Aids. The Mercury Phoenix Trust was set up in Mercury's name in 1992 to fight Aids worldwide. In addition, the final instalment of Queen's remastered and reissued albums has also been released. Adele has graced the front cover of UK Vogue, and used the opportunity to insist she's happy with her figure. Singer-songwriter PJ Harvey could become the first act to win the Mercury Prize twice if she proves the bookies right and picks up the award later. Katy B has revealed she is trying not to think about her chances of winning the Mercury Prize this week - for fear of jinxing it. Chris Brown has rewarded an honest fan who returned his Rolex watch after he dropped it at the MTV Video Music Awards.The F.A.M. Members of Michael Jackson's family are to team up with producer David Gest in a touring tribute to the late superstar. Rapper Example stormed straight to the top of the singles chart with his track Stay Awake.The song is the lead single from his new album Playing in the Shadows. Singer-songwriter Adele has been forced to cancel the first two dates of her biggest ever UK tour due to illness.